Unleash your imagination when Mickey Mouse lights up the night with a procession of Disney Characters and a pageant of magical visions. 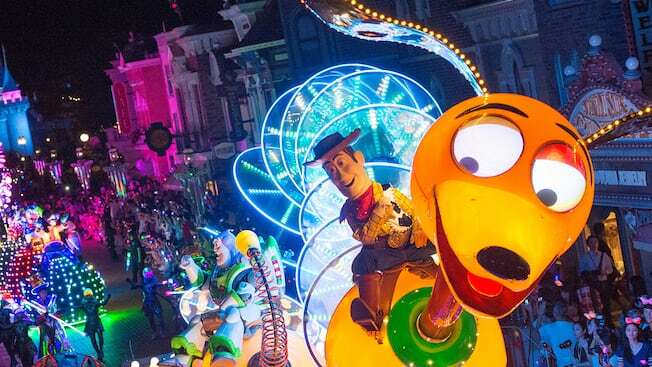 Brighten up your night by watching this parade of pixie-dust infused light and color! Using the entire park as his canvas, Mickey transforms just about everything in Hong Kong Disneyland Park into a gleaming vision. See some of your favorite Disney Characters like never before—dancing, singing, and aglow with enchantment! Tinker Bell, Ariel, Belle, Lightning McQueen, Buzz Lightyear, Sheriff Woody and Mike and Sulley all join in the fun—and illuminate the celebration! Download the official mobile app to discover schedules for shows and parades! View wait times for attractions, locate favourite characters, browse interactive maps and much more.